This document shows how to override the default Alfresco email handler. This document assumes you already have Alfresco 4.0 Community Edition installed you have inbound email already configured. Why would you want to override the default inbound email handler? Well, I am sure you can think of many reasons, for me I had a project for a company that would forward emails from gmail and send them all to the same folder. The custom email handler would check for an attachment and based on its name save it to a different folder. Also it only saved the attached file and not the email itself. According to http://wiki.alfresco.com/wiki/Inbound_SMTP_Email_Server_Configuration#Configuration  you should be able to copy this folder over to / opt/tomcat/shared/classes/alfresco/extension/subsystems/email/InboundSMTP/inboundSMTP-context.xml and have it override the default alfresco XML file, but I can never get this to work for some reason. I merely copied it over, but it never overrides, if anyone has any advice on this I would love to hear it. Now that the default inbound email handler is overridden a new class needs to be created to replace it. In the prior section we are looking for a class named com.10x13.alfresco.email.CustomFolderEmailMessageHandler . Therefore we need to create a program with this same name. Now before I go too far I want to say this example overrides folderEmailMessageHandler which only overrides the inbound email handler for folders. There are other handlers for other objects in alfresco. Now for the program! I am just going to use command line javadoc and jar to create the program, feel free to use your IDE of choice to do this in a more appropriate way. First make a simple program that will overwrite the default folder email program and just output a log message. This will place the .class file in the dist directory. > jar cfv custom-email.jar -C dist/ . Now that is all well and good but all we really accomplished was to write a log message out. Let’s do something real. Now for some details, first you will notice that processMessage no longer calls its super class, leaving this class with the sole responsibility to handle the incoming email to a folder. In this part of the code you can see how you can get the String for where the email was sent to “message.getTo()” who the email was sent from “message.getFrom()” and the subject line “message.getSubject()”. 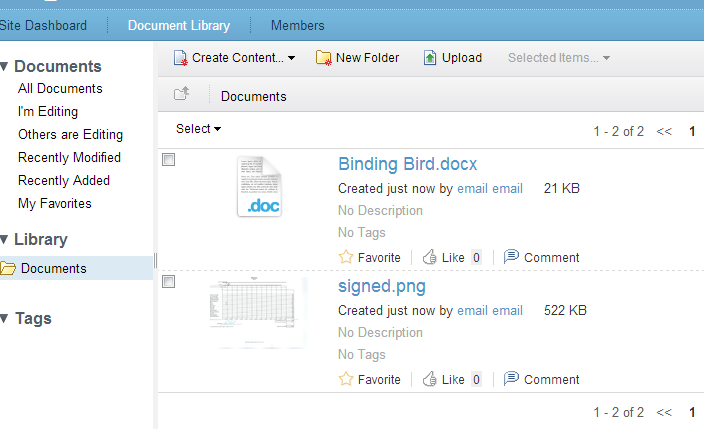 An email can contain several attachments so this is here to iterate through each one. The if statement is for a special case. 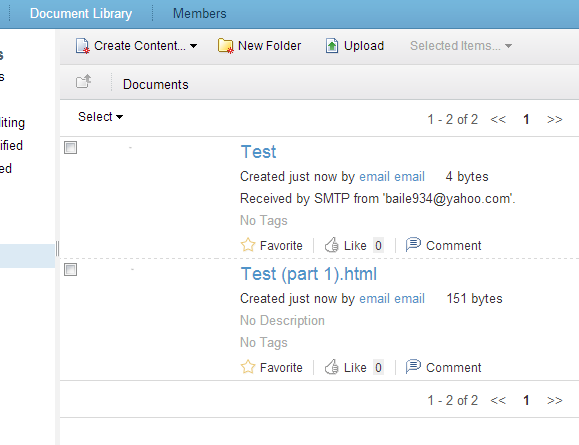 Alfresco considers the body of the email to be a file, well it creates an html version of it. It names it after the subject line plus a few characters the .html. This may not be the best way to skip uploading this object but it works well enough for a demonstration. contentIs = attachment.getContent(); gets the java.io.InputStream of the attachment. This guesses the mimetype based on the name. There is another one that guesses the mimetype based on the name and does a quick search on the file, but that is more processing time. If my memory serves me right on this one, it create a stub file to write to in the correct location. folderNodeRef must be the parent director you want to place this file into. The Boolean on the end, if set to true, will overwrite any file with the same name, if you set it to false it will change its name so it can still be uploaded. If I remember right I remember this being an issue with action folders. If a folder will perform an action when a new file is created within it then this addContentNode will cause that action to happen even though we have yet to write to it, just a word of warning… that is if I remember correctly. Now recompile the code, add the new jar file and restart tomcat. And here you can see that the folder only contains those attachments and no other fluff. I hope this guide helps you out. It was a pain when I had to figure it out. I've been referencing your blog a lot lately, and I thank you for your Alfresco posts! I think I've discovered how to extend the inboundSMTP-context.xml without simply overwriting the original. It appears that due to changes around 3.2-3.3 (https://issues.alfresco.com/jira/browse/ALF-4361), the new path for overwriting the inbound and outbound SMTP is now extension/subsystems/email/InboundSMTP/inbound/inboundSMTP-context.xml. Just wanted to pipe in and give my 2 cents! Well written and very easy to follow. Perfect HowTo. Thanks a lot. It saves me ages. Even works with Alfresco 5.1. I have only a little issue. My annomymous user catches no mails. ERROR: "The eMail user [mail hidden] does not referece a valid accessible node"
The user is in group EMAIL_CONTRIBUTORS but no admin user in alfresco. I setted up a folder alias. But i do not recive any mail. For all other users it work like a charm. Any help?